When the GoPro first came out in 2004, it was less of a technological innovation and more of a conceptual one. At the time (and few remember this) it was actually a still film camera, not a video camera at all. Over the next eight years GoPro would slowly integrate video camera technology (mostly developed for cell phones) into their base design, bringing the megapixel count along a little bit with each model, and always with GoPro’s signature waterproofing and the wide camera angle which GoPro famously brought to action sports. By 2011, with the debut of the HD Hero 2 model, the video quality had reached a level appropriate even for TV use (indeed, much of the recent Animal Planet show Fish or Die was shot on GoPros). 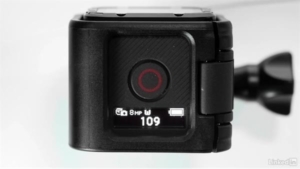 However, all of the early video-enabled GoPros shared a couple critical flaws: (1) sound fidelity, which was frankly horrible with the microphone hidden inside the waterproof shell, and (2) battery life. The battery life issue was somewhat offset by the ability to change batteries, but even with a fresh stack handy, you were limited to only minutes of shooting at a time. Until recently, all GoPros looked more or less like this. The other thing all early GoPros had in common was a basic form factor: a rectangle with a lens offset to one side and a set of, frankly, clunky controls on the other. 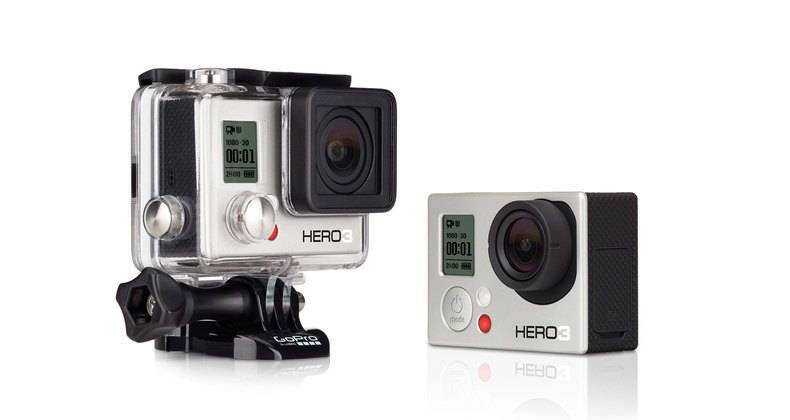 Last year, however, GoPro took a critical step forward with the Hero Session: they integrated the waterproof case with the base unit. This came with huge advantages and one key trade off. Advantage one was sound fidelity: because the microphone is now *outside* the enclosure (but still perfectly waterproof), you totally lose that ‘inside a closet’ sound issue from all earlier GoPro models. Before, if you wanted to record something with decent audio you had to pry the camera unit out of its case, which of course meant it was no longer waterproof. With the Hero Session, that issue is gone. 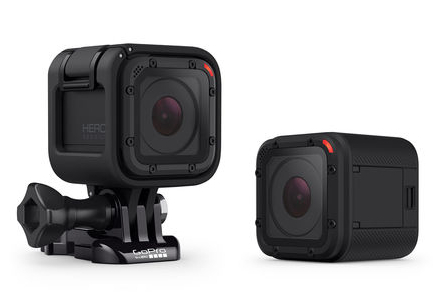 Secondly, with the Hero Session model, GoPro simplified the button interface. Earlier models had a power button, a start button, and a super annoying and hard to access Wi-Fi button (critical for interacting with the camera via the GoPro App, which has also improved, but equally critical to turn off when you’re done so that the batteries don’t run down). Now the Hero Session has only two buttons, which control a much more intuitive interface, which is also brightly lit in clear white lettering instead of looking like a calculator. The ease of use factor is at least 50% better (although all of these types of cameras will inevitably receive an Apple Watch-style tablet interface, once the technology has advanced sufficiently). The Hero Session’s interface is now brightly lit. The final big advantage is that the form factor is much more intuitive to use when shooting. New skeleton cage designs allow the camera to be mounted from below or from behind, and generally make it easier to configure a shot. The key disadvantage of the Hero Session is the lack of a removable battery. In my testing so far, this has been less of an issue, as (similar again to Apple hardware), the integrated battery lasts longer in the first place than a removable battery would. GoPro claims it will handle continuous shooting of 2 hours, and while that may be a touch optimistic in real world use, I’ve certainly used the Session off and on all day without running out of power. With the Session you also get a significant price advantage, since this is ostensibly an entry level camera. As of this writing the flagship Hero 4+ is $500, while the Session is a mere $199. I would rather have the Session, to be honest. It’s easier to use, simpler, and takes both excellent video and audio. If you’re a professional filmmaker, GoPros are mere toys in the first place, useful for a few shots at best. If you’re an amateur just looking to document your outing for sharing on social media, the Session is the better fit. There’s less to get wrong, your audio will surely be better, and it’s just an all around better bang for the buck in many categories. In my mind the Session is the design GoPro will focus on going forward. 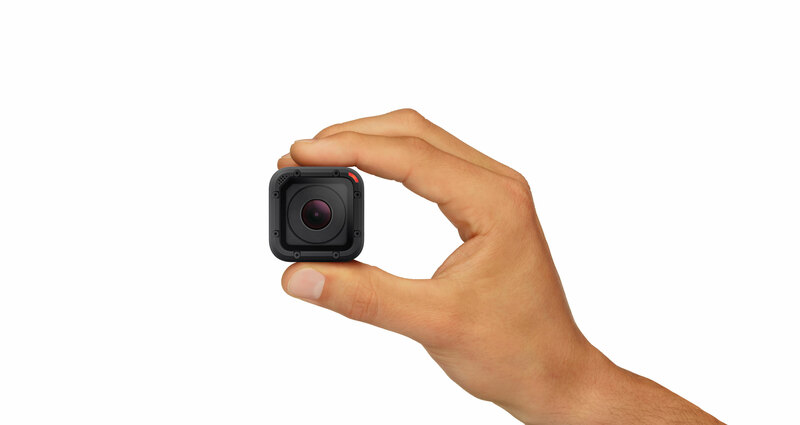 I think its little cube is the start of something big, and if you’ve been holding off on getting a GoPro due to cost or clunkiness, check this one out.